Take a leisurely long cruise on the 4 star Ms Hamees on the majestic Nile while visiting the most famous ancient Egyptian sites en route. Choice of 14, 12 and 9 nights, limited departure dates. 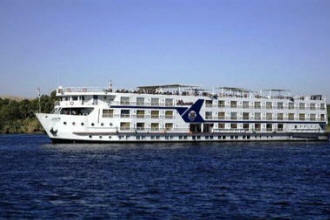 The MS Hamees has 72 spacious outside cabins designed for your relaxation decorated tastefully with comforting colors. Enjoy the views along the fertile Nile during a relaxing sailing from from your panoramic windows or let yourself be caressed by the mild river breezes on the sun deck located on the top of the ship from your lazy sun chairs. Private Bath with a bath tub in all cabins & Hair dryer in bathrooms. Satellite, LCD T.V. & music TV channel. In House Video channel and Video player. Safe deposit boxes & international line will be through the reception desk. All outside cabins facing the Nile with large panoramic window except the lower deck cabins with two sealed marine windows, luxuriously furnished, air-conditioned and latest amenities. 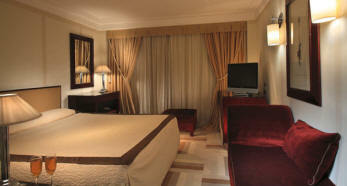 MS Hamees offers a variety of dining and entertainment options. Among these is the main restaurant offering sumptuous buffets for breakfast, lunch and dinner. The Lounge Bar is spacious and elegantly appointed, the perfect place for dancing or watching entertainment shows in the evenings. It's also where you can enjoy afternoon tea and a variety of cocktails. On the Sun Deck, take in the stunning views of the river Nile and relax with a cold beverage or dainty snacks. 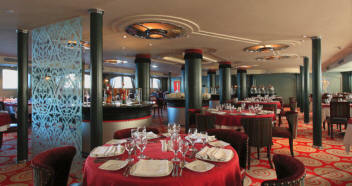 Spacious restaurant seated up to 142 guests with luxurious lounge. Swimming pool, sun deck with recreation area and bar. Library, reading and playing room. Internet through the USB modem. Length 72 m Width 14.80 m Height 11.50 m.
03 Generators 318 k.w each.